In 2013 Fall, I bought a TFT LCD Screen for my Arduino Uno (r3), in order to increase the level of fun I get from electronics. Especially after EE203 course, it is fun to play with something that works without making you crazy at the end of the day (check this hotel-safe circuit, that I built for course project. Painful hours.). I got rid of all of the cables of my hotel safe project that were attached to the breadboard. 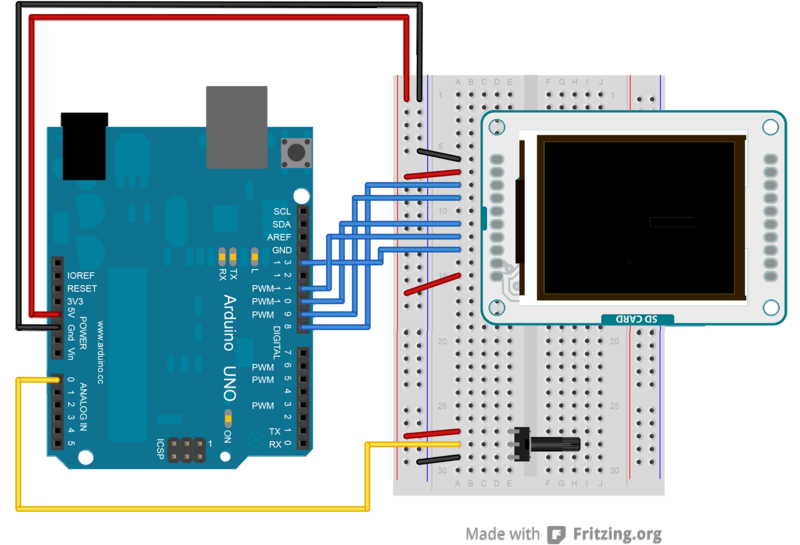 By looking this schema, I connected my TFT LCD Screen to my Arduino Uno. I tested it with TFTDisplayText example. At 2:00 AM, with an unknown inspiration, I put a small challenge to myself to make the game Pong playable throughout the serial port. Bye bye Objective-C, welcome Swift! Today, Apple released its new language which claims to lose C from ‘Objective-C’ and much more. I downloaded Xcode 6 Beta and tried to implement a simple HTTP Request, after reading some of their very good-written documentation about Swift. For brief features here, for iBook version here. My first impression is, it seems like a good language, however popularity of this language will be increase not only by that, but also the great market. The reason why Objective-C is on Top 3 in TIOBE Index, my personal opinion is because of that. Swift syntax seems much clear while comparing with the Objective-C version of the code above, despite its cleanness, I believe some of the core Objective-C libraries must be rewritten. Small note: My async handler unables to access to the UI, for some reason I don’t know(weirdly sometimes does). I tried to implement it by looking some of my old Objective-C implementations. Since there is nothing on the web about Swift now. (It is released just today, come on!) If you know why, it would be great if you write a comment. Update: This is because of GCD. Please check this detailed explanation.